It seems that at 46, I am finally understanding that this is my life: choosing the jobs that I am good at, when they come to me. Because they do, come to me. I will do a job for a number of months or years, and then one day, I will feel the need to change and then, a new job will come along. This means I am never bored. I will never sink myself into a dusty job, in a grey and boring office, doing repetitive and uninspiring tasks, day in and day out. My life is to change and move and go where my instinct takes me. And I like it that way. Not doing furniture restoration as a full time job is not really what my problem is. My problem is to ensure that I do not compromise my life by taking a job that will make me unhappy, and feel that I am wasting my life. I am happy where I am now, and I will thrive to continue to make me happy. I will stop this blog today, as I have another challenge coming up which I want to concentrate onto, which is another story. I will continue to update the website with my paintings, and whenever I manage to work on a new piece of furniture to redecorate or restore. Please feel free to contact me via my website’s contact page for any queries. I have finished the back, with the challenging buttons. That part is now ready for the final fabric to be installed, but I will get that done much later, when the rest is finished up to a similar stage: the calicot (the cream cloth over the hair). 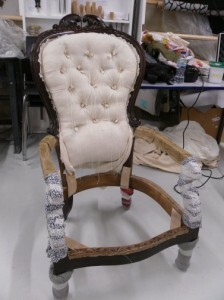 I am now working on the seat. 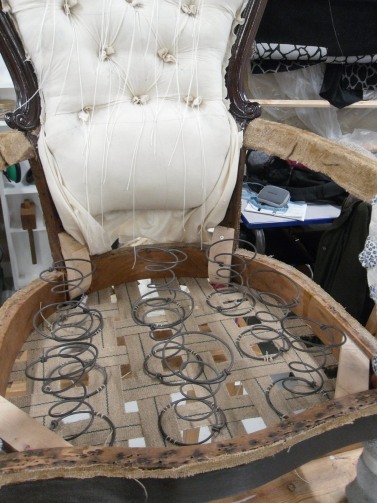 I have installed the springs, and finished the stuffing of the first layer of hair which I will, next week, sew tight in order to shape the seat. This may take a couple or more weeks as it is very time consuming and difficult, as well as hard wearing for the hands. I shall have to wear thick gloves. I won’t be able to finish the upholstery this academic year. I have too much on in the evenings and need to prioritise next year. Upholstery, I have come to realise, isn’t my priority, so next year, I will give it a rest. Hopefully, I will have finished the seat and done a bit of the arms, enough to allow the armchair to be useable until the time comes to finish it. I was disappointed a few weeks ago when I realised that I wasn’t going to have enough time to finish it completely, but then my teacher pointed out that it is a tough project and should be viewed as a long term one. I have decided that she was right, and in fact, I should be proud of what I have done so far to this armchair, considering that it had been in my family since the early 80s, in a out-house, in the damp and being used solely by colonies of mice. 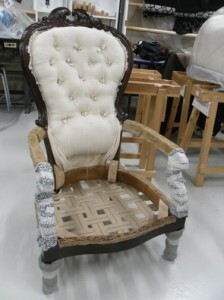 Since then, I have restored it and the upholstery is well under way. I can afford to take a year off before I finish it. And suddenly, for the past few days, it is all becoming clearer to me: I really would like to find a job in a museum, or a place that has a vacancy for someone to restore/maintain tiny wooden items. Really, what I need to do now is to get some old and damaged boxes to restore at home. I still don’t have a workshop, but I have enough room to restore small items and therefore sharpen my skills and create a portfolio of sorts. And who knows, make a bit of money selling the restored items online? As for BF, he has made a decision that he needs to change career completely which I can see he finds overwhelming. So far, I have been encouraging him to make his peace with quiting his current career, and spend some time grieving it. You can’t work in a job for 25 years and not feel a bit panicky at the idea of changing path. I reassured him that when the time is right, he can spend time investigating other options, but in the meantime, it’s best to focus on accepting his current situation, rather than acting out his feelings of panic and apply for all sorts of unsuitable jobs which he won’t get because he will be ill prepared. I can feel very settled where I am, but I still crave to go further. My job is getting better, I am learning about the weird and wonderful world of double glazing, conservatories and garage doors, their corresponding complaints and all that goes with it. Who would have guessed, only last year, or even just 4 years ago when I was preparing to move down South to start a new life, that I would be working for a double glazing company and actually enjoying it! It seems that I do love working in the world of home improvement. I enjoyed B&Q, learnt loads during my time there, and now I realise that this is a world that I appreciate and can, somehow, connect with. My life here is taking shape. Gone are the times when I worried about whether I would find a job that would earn me enough to make ends meet; wondering what kind of job I could possibly get with the skills I had. It turned out that I did have the right skills for a job in customer service, only I needed to fine tune them to adapt for a specific category: the world of home improvement. So I traveled that way through the world of furniture making, and here I am, happily settling in a job that allows me to use my knowledge, and also challenges me intellectually and emotionally. Dealing with customer complaints can be draining, but I quickly realised that I have excellent boundaries that allow me to not feel personally attacked by each customer venting their frustrations to me. I am naturally emphatic and that, too, is a very useful skill for the job as it enables me to connect with my customers in a way that my colleagues can’t always do. My London flat is selling: it was on the market for less than a week when the estate agent told me I had had 3 offers including 2 above the asking price! If all goes well, BoyFriend and I will be able to buy a 2 or 3 bedroom house with garden and garage/workshop this year, a home of a size I couldn’t dream of owning while living in London. A lot of things can still go wrong as the survey still needs to get going, but I am hopeful that things are taking shape. So far, my only disappointment is that I can’t use my furniture restorer skills. I am looking forward to being able to purchase a place big enough for me and BF to have our own workshop. We both crave that as we are both missing working with timber very much. And anyway, life is a journey. So far, it has been wonderful and inspirational. It isn’t the end yet. I am sure that my restorer’s skills will be coming back in the front line sooner or later. During this time, BF is pondering heavily about what to do about his career. He is very undecided, which is fine: I told him that now is not the time to look for work and apply for jobs that will be making him feel the same as he feels now. Now is the time to sit back and ponder about how he feels and about what he would like to do. Who would have thought that life in the country side would be so busy! I have very little time left for myself as I work from 9 to 5:30 pm, then I have 3 evening classes a week. The other 2 evenings, I am usually so tired I just want to collapse and read or watch TV. And at the week end, I spend that time catching up with things I haven’t had time to do during the week, such as simple food shopping. BoyFriend is the same, with his teaching job. He often has marking and class preparation stuff to work on in the evening, so our week ends are usually about running around like headless chickens, doing shopping, getting the laundry done, and running other errands that we can’t do during the week. My evening class in upholstery is going well, but I will be glad when it is over. I have finished the back of the chair, and it took me since September to do it. Now, I am only just starting on the seat. So far, I have stapled the webbing and tied the springs. With the webbing. With the springs. My other evening class is karate of course, Mondays and Fridays evening, and I am working hard at it as I still haven’t got my next belt. Regular readers might remember that I took my last grading in July 2011, as I was preparing to move down South. I wanted my next belt before I move and I did get it: brown belt 2nd Kyu. But that was more than 3 years ago. Because I was a full time student, I never practiced my Karate as seriously and consistently as I should have. So now, I am still catching up to get back to the level I should be at in order to pretend taking my next grading: brown belt 1st Kyu. Then after that, it is the dreaded but hotly anticipated Black Belt!!!! During this time, I have found an estate agent which is currently advertising my London flat in order to sell it. Slow process also as he needs to post things to me for signature, and there is a tenant in the flat which means that there will be less interest in the flat. The tenant will vacate the flat in September, and I really hope the flat will be sold by then as I don’t want to find myself with an empty flat and a mortgage to pay! I am very sad and disappointed that my business idea never took off. I find it almost insulting that I only managed to get one paying client last year, despite having come up with a good business plan (according to my business adviser). I spent so much time working on this business that I am actually quite gutted. I don’t understand what I could have done differently in order to make it work and get those elusive customers. One thing is for sure: Twitter was definitely not for me! I spent a lot of time studying it, reading about it, learning it, and I did spend a lot of time making it work, until I realised that actually, I really don’t enjoy spending so much time trying to be witty enough to attract more followers who demand witty tweets regularly. Too much effort and too little reward. Right now, I am doing the things that I enjoy: a job that I enjoy, and time and money enough to do things I like doing such as eating good food, going to the cinema from time to time, and buying some art material: my open mic evenings every Thursdays are very enjoyable and I have already sold one painting since January by just going there to show what I do. And also, in the middle of all that, helping BoyFriend find himself a new career! His job is so tiring and demanding that he has recently come to terms with the fact that he would like to find something less demanding, and since I have some (!) experience of that, he gratefully accepted that I guide him through this new journey. So hold on to your hats folks, the career change journey ain’t over yet! I feel incredibly serene these days. I haven’t felt that way in a long time. For the past years, I have worked tirelessly to change my life by moving home, renting my flat, studying full-time, working part-time, and finally, dealing with being unemployed for some time before finally finding a job that allows me to earn enough money to live properly on. My dad was here for a few days, and I thoroughly enjoyed my time with him because for the first time in four years, I was able to treat him. I paid for food, petrol, travel-cards, museum tickets and so on. Before now, I had to hope that he would be able to pay for a few things as I would be counting my pennies each time I opened my wallet with a beating heart and hoping I’ll have enough money to finish the month and not starve, or have to borrow money from BoyFriend. So these past few days, imagine my smugness when I realised that I could afford to pay for everything I wanted us to do, including feed my dad. As a 45 years old adult, it is, of course, a basic need to be able to treat others, especially when they are your elderly parents coming to visit. You want to treat them well and look after them properly. And this time, it is exactly what I managed to do. BoyFriend did ask if I had enough money for everything, and I replied that money was no longer an issue! When I think of all the treats that BF had to pay for while I was studying and looking for work, it always made me feel uncomfortable that I had to rely on him for my comfort and basic well-being. The interesting thing is that nowadays, considering the kind of job that I have, Iearn about half of what I used to earn when I lived in London. But since everything is cheaper here, I have managed to adapt to my new circumstances and needs. For example. I am still in the process of emptying my home of all the junk accumulated over 24 years of living in the UK. And to get rid of all that makes me realise that there is no need for me to buy more stuff. If I get rid of things, it means I don’t need them. So since the beginning of the year, I have hardly bought anything for myself, apart from food, which automatically resulted in money not leaking out from my bank account. Also, we decided to not get a TV licence. It turns out that you only need a licence if you watch programs live, which we don’t do. We don’t have a working TV aerial anyway, which means we can’t watch live TV at all. And instead of getting it fixed, we realised that actually, we are pretty happy this way, with no TV blaring adverts and other inconvenient and intrusive noises when we are trying to find an interesting program. The interesting programs that we want to watch are available on the internet and we can watch them when they are available after being live on TV, or from youtube channels, or we pay for them individually on a variety of websites that sell them. So that is another expense cut. I could go on. The fact is that my life has now simplified to such an extent that I am now typing my blog at home, feeling very comfortable, cosy, safe and happy in my little one bedflat shared with BF, knowing that tomorrow, I will be driving to an interesting job which holds my attention and keeps me on my toes. I have started the ball rolling in order to sell my flat in London, and BF and I are now looking forward to spending the rest of our lives on the South Coast, near the sea and in the middle of the hills of Hampshire. I am happy I did move 4 years ago. I managed during that time to achieve all that I had planned to achieve, including finding a new job and keeping a hold on my flat, and as a bonus, I found myself a partner. So don’t be shy: you want to change your life? No problem! It is possible and I am the living proof of it. It is hard work and will require lots of careful planning and organisation, but it is very much worth it.